Beginning in 1921 and 1922 and apart from the war years in the 1940’s (Men – 1942, 43, 44, 45 and 47 / Women – 1943 – 45), City & District Champions have been declared on local golf courses in the Ottawa area. 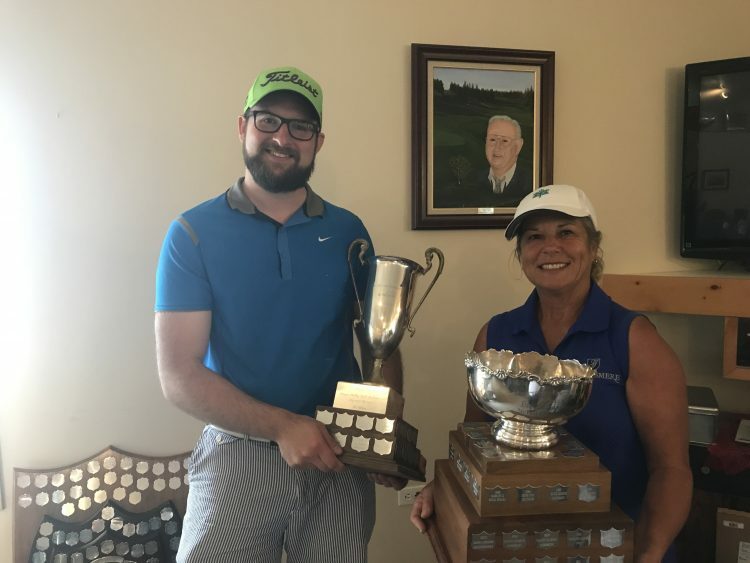 This year, four Ottawa Valley Golf Association City & District Champions were crowned in 4 Divisions after play at Greensmere and Royal Ottawa golf clubs. The weekend play started on Saturday, June 24th at Greensmere Golf & Country Club with players in all divisions posting 1st round scores. Based on scores from day 1, starting times were established for Round 2 at Greensmere and roughly half the field began play before the weather gods interfered again. What started as a beautiful day for golf ended with the cancellation of Round 2 after 2inches of rain and hail stones covered the golf course in five minutes. The rules officials, under the leadership of Gerry Bower had brought the players in before the storms hit. Thank goodness for I-Phones and weather aps as torrential rain and lightning forced the abandonment of the round after players were safely off the course and in the clubhouse. The course of action after the cancellation of Round 2 was to declare champions in Men’s City & District “B” Class and Division 2 Women’s play based on first round scores. Public player Myles Peterson (79) and Greensmere Member Sherry Rodenkirch (86) were awarded the SFM “Swatty” Wotherspoon Memorial and Rose Bowl trophies respectfully based on their first round play. Mountain Creek’s Jaegar Prot (80) and Smiths Falls Howard Radford (83) finished in 2nd and 3rd place in the OVGA City & District “B” Class Championship. In the Women’s Division 2 City & District Championship, Rideau View’s Sandra Chisholm (87) and Casselview’s Michele McNeill finished in 2nd and 3rd place. The 3rd round of the OVGA’s City & District Championships was held at the Royal Ottawa Golf Club on Monday, June 26 with 45 Men and 16 Women participating in “A” Class and Division 1 competition. Carleton Golf & Yacht Club’s Lise Jubinville (79-82-161) was the winner of the Women’s Division 1 City & District Championship. She was the leader after round 1 and her third round score was sufficient enough to give her a third City & District Championship win and the Ahearn Trophy. 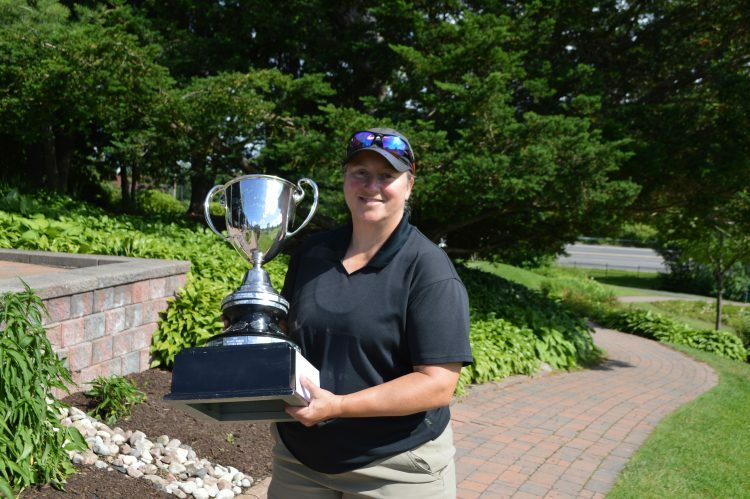 She had won previously in 2005 and 2011 and had also won the OVGA Women’s Match Play Championship earlier this year. Finishing in a tie for 2nd place with total scores of 164 were Rideau View team-mates Susan Pearl (81-83) and Kristin Ranieri (80-84). Susan had won the Women’s City & District in 2012 and Kristin equaled the win in 2014. This was also the first year that the Women had participated in a third round in the City & District Championships and they were quite happy with the change. There’s a new name on the Gerald Lees Cup, donated by Dr. P. D. Ross and that name is Jean-Francois Guillot from Kingsway Park Golf Club. 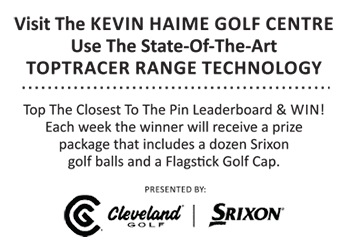 His rounds of 73 at Greensmere and 72 at Royal Ottawa gave him a total score of 145 and a two stroke victory over Eagle Creek’s Ryan Sevigny (76-71). In third place with a score of 148 (74-74) was GreyHawk’s Tim Doyle. Fourth place went to 8-time City & District Champion Allen McGee (73-76-149) from the Stittsville Golf Club. 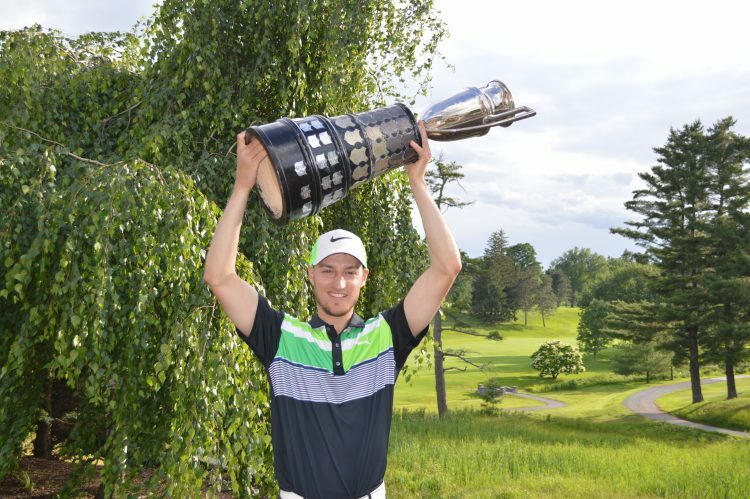 Next up for many of the OVGA men is the Golf Quebec Alexander of Tunis event at Rivermead on July 16-17. Competitors in the OVGA City & District Championships had nothing but praise for the Greensmere and Royal Ottawa golf courses as well as the OVGA Officials who put in hours of time making sure the event was successful. Tournament Directors Diane Illingworth and Marc Ffrench praised their volunteers and thanked the owners and members of the Greensmere Golf & Country Club and Royal Ottawa Golf Club for allowing the OVGA to hold their City & District Championships on their golf courses. Congratulations to OVGA officials and volunteers on another job well done.